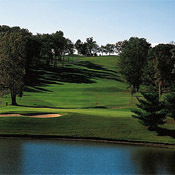 Windtree Golf Club is widely regarded as Nashville's finest-conditioned public golf course. Meticulous attention to playing conditions provides golfers of all ability levels pristine fairways and smooth, true greens for a spectacular round of golf every time. While the course is located only minutes from downtown, panoramic views make this breathtaking course a remarkably quiet escape from the hustle and bustle of everyday life. Located in beautiful Mt. Juliet, Tennessee this scenic 18 hole championship course is widely known as the finest conditioned public course in Nashville. Golfers of all abilities will appreciate the wonderful playability of this top-conditioned layout. The picturesque course features a links-type layout on the front nine, and elevated hills on the back nine. A dramatic panoramic view of rolling hills and trees, with no visible roads or homes, make Windtree the perfect "escape from it all."